After each full round, you will complete one sprint of your choice: sled push, sprint on the rowing machine, outdoor sprints, sprints on basketball court, etc. Each sprint should last 10-15 seconds and should be done at full speed. This workout is incredible if you push yourself hard and minimize your rest periods. Pick a number to perform each of the exercises above and try to stick with that number for the entire set. After completing each set, you can bump your number down or stay the same depending on how you feel. For example, I would try and complete all the exercises above doing 10 repetitions each with 30-60 seconds rest in between. After completing all the exercises, rest for 45-90 seconds and repeat. For the second set I may choose to do 8 reps each or stick with 10 depending on how I am feeling. For beginners, you can do 2-4 pull-ups or assisted pull-ups. Intermediate can range from 4-8 pull-ups and advanced is anything above eight. This workout is very demanding so be sure you are doing all the reps perfectly. You are trying to complete all the exercises above in the shortest amount of time possible. After running the first mile, you can then complete the pull-ups, push-ups, and bodyweight squats in any fashion you choose. You can super set them or do them in order, it is up to you. In my experience, it is best to superset everything so your different body parts can get a little rest. For beginners you may want to start by doing a half mile or even one lap, then do 25-50 pull-ups (or jumping pull-ups), 50-100 push-ups, and 100-150 bodyweight squats. After you start progressing in your fitness you can bump the numbers up. Remember to time yourself doing this workout. Your goal is to finish everything as fast as possible (while having great form on all the exercises) then to beat your time the next time you do it. As you can see the total time of this workout is only 6 minutes including the rest periods. Therefore you can complete anywhere from 3-7 full rounds depending on your fitness level. Be sure all repetitions are done with great form. To start, pull the sled towards you until it reaches your feet. Once the sled reaches you, drop the rope and push the sled back to where it started. Once you push it back, bear crawl backwards to your starting point. So one round would be: pull the sled towards you (25 feet), push the sled 25 feet, bear crawl backwards 25 feet. You will repeat this 5 total times. You rest while your partner is going. 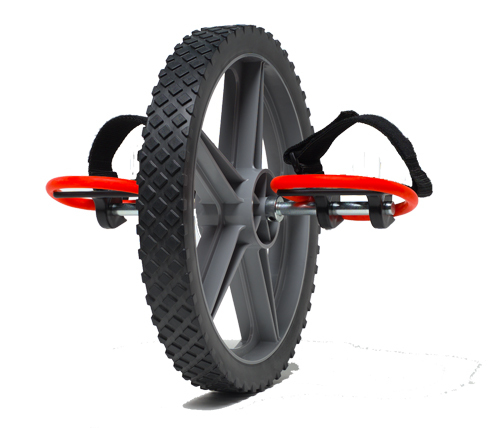 Power Wheel Hand Walk: Attach the power wheel to your feet, balance on the wheel and walk forward on your hands. Be sure to keep your back straight and core tight throughout. Heavy Rope Training: Check out this video for how to do the exercise. It is the first exercise on the video. Circuit Description: Each partner starts at a different station. The partners on the Heavy Rope and Power Wheel will do the exercises until the person on the Bear Crawl Chain Pull is done with all 16 reps. Once they are finished, you move quickly to the next exercise. After each person has completed all three exercises, that is one full round. Complete three rounds! This is an incredible workout and is very fun because you can push each other hard throughout. Plus it can be done in about 15 minutes! Repeat 4 times. Rest 30 seconds between full rounds. Keep track of the time it took to finish the entire circuit. Then the next time you do it, try to beat your time!